Published on 22 August 2012. As I’ve logged on to post this, I’ve just realised that I didn’t post a picture yesterday! I’ll have to do another later to make up for my forgetfulness! 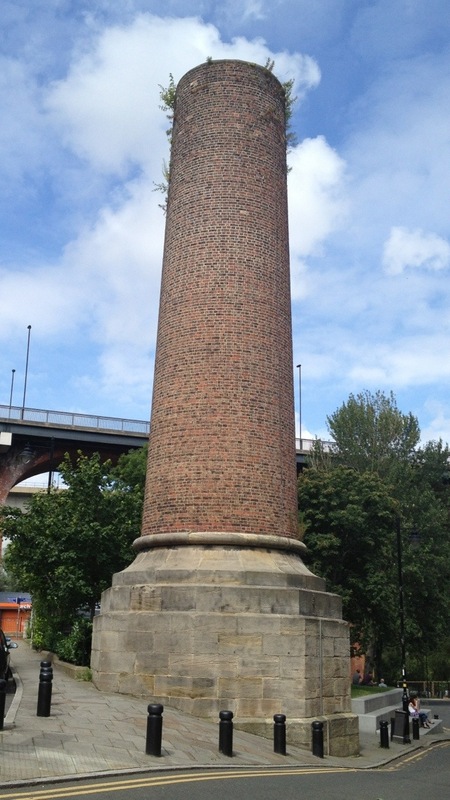 This is the Lime Street Chimney here in Newcastle. It was part of a flax mill built by John Dobson in 1840, now converted to The Cluny, one of Newcastle’s most famous bars. Everyone who’s anyone on the music scene has performed there, from the Arctic Monkeys to Danni Minogue, from Mumford & Sons to Kate Nash. The chimney has been out of use since about 1900, and was once converted to a blacksmith’s workshop. At some point around the 1930s, the chimney was reduced in height and filled in. I hope the blacksmith had left by then, or he’d have had an awful shock when he turned up to work! This 1,775th post was filed under: Photo-a-day 2012, Newcastle-upon-Tyne.